“Charlotte County has been chosen to be featured in a television pilot called Buying Beachfronts. Dr. Stephen Leatherman, better known as “Dr. Beach,” profiles America’s best beaches and rates them on various criteria, from landscape to health, for example. This pilot will be different, though — it’ll focus more on the best waterfront properties with a little science added into the mix…” Click here to watch the video from nbc-2.com. North Port ranked in top 10 again! North Port in the news again – ranked among the top 10 small cities to move to. 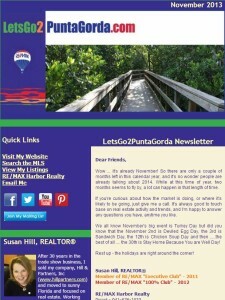 Want to know more about Punta Gorda? Look at this month’s LetsGo2PuntaGorda e-newsletter here. If you would like to be entered in our monthly drawing for a chance to win a $25 American Express gift card, just like our Facebook page at www.facebook.com/letsgo2pg. **Please note: We’ve had problems contacting our winners. Please provide your contact information via email to krysti@letsgo2puntagorda.com or online through www.letsgo2puntagorda.com, so we can send you your gift card!